Chrysalyn Z. Gocatek, MA Demography graduate at the UP Population Institute, has recently published a chapter in an edited book about the occupational mobility of Overseas Filipino Workers (OFWs). Entitled, “Changing Locations and Changing Jobs: Examining the Correlates of Occupational Mobility of Overseas Filipino Workers” (In S.C.Y. Ku & K. Kironska (Eds.) (2016), Migration in East and Southeast Asia (pp. 171-212). Singapore: World Scientific Publishing Co. Pte. Ltd.), the chapter uses data from the 1994 and 2003 Survey on Overseas Filipinos to examine the direction, patterns, and correlates of occupational mobility of Overseas Filipino Workers (OFWs). Included in the analysis were a total of 2,162 OFWs from the 1994 Survey on Overseas Filipinos (SOF) and 2,547 OFWs from the 2003 SOF. Occupational mobility was operationalized by comparing the information on the usual occupation of the migrant workers before departure and their work overseas in the SOF and by applying Ganzeboom’s International Socio-Economic Index of Occupational Status Scores for the International Standard Classification of Occupations 2008. Results show significant differences in the occupational mobility of males and females whereby majority of males in 1994 generally did not change occupations but females were mostly upwardly mobile. Moreover, with pooled data, results reveal significant changes in occupations between the two time points. Finally, a number of socio-economic factors specifically age, marital status, household headship, education, region of origin, country of destination, and duration of stay abroad had significant correlations with OFWs’ occupational mobility..
Gocatek currently works for the Department of Social Welfare and Development. UP Population Institute alumni Dr. Andre Arnisson Ortega and Dr. Maruja B. Asis are members of the Canada- Philippines Alternative Transnational Economies Project (A.T.E. ), a four-year (2015-2019) research project funded by the Social Sciences and Humanities Research Council of Canada through its Insights Grants Program. Led by Dr. Philip Kelly, it is based at the York Centre for Asian Research (YCAR) at York University,Toronto. It involves researchers from both Canada and the Philippines. The research project is interested in transnational economic practices that fall outside either the mainstream economy of corporate trade and investment or the private flows of remittances between family members. It seeks for linkages that depend on the social networks created by migration and which generate or promote collectivized or non-monetized forms of well-being including humanitarian fundraising for typhoon victims, collective financing of social infrastructure such as school or clinics, donation of volunteer skilled labour by members of the Filipino diaspora who return to the Philippines, networks of unpaid labour to care for children and the elderly, the fostering of alternative economic imaginaries through activism, and the creation of channels to export products from small-scale and sustainable enterprises in the Philippines. On the evening of Nov. 8, 2014, in celebration of the UP Population Institute’s 50th founding anniversary, UPPI alumni and staff gathered at the East Richmonde Hotel in Eastwood, Libis, Quezon City to celebrate. Here are video snapshots of the event in all its glory and glam. The following are some selected pictures from the homecoming. During the research roundtable, migration experts Dr. Maruja Milagros B. Asis of the Scalabrini Immigration Center and Ms. Imelda Zosa-Feranil of the Futures Institute weighed in on the issue of overseas work and its impacts to families. This is a short clip of their comments on the matter. 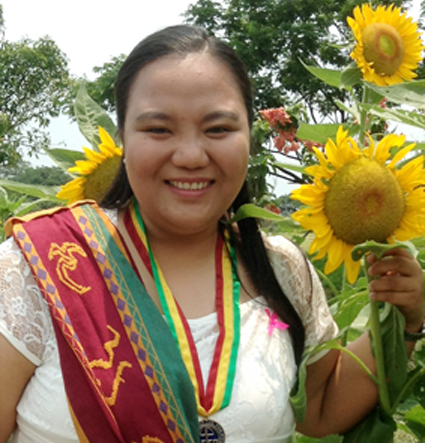 Dr. Maruja Milagros B. Asis, UP Population Institute alumna & Scalabrini Migration Center Director for Research and Publications, on how her training at the UPPI has helped in her professional life. Hear more from Dr. Asis in this special Q&A for the UPPI’s 50th anniversary celebrations in November 2014. “The institution provided opportunities for us to participate in their research projects… where I had first-hand understanding on how the research process works." The three years I spent in completing my degree from UPPI were very worthwhile. The knowledge and skills I gained from both inside and outside the classroom contributed largely to my personal growth and career development. UPPI professors engaged us in interesting discussions on theories and methods on population. They supplemented them with real-life examples and practical applications—mostly drawing from their professional experiences, which proved their expertise on the subjects that they were teaching. The institution provided opportunities for us to participate in their research projects. I had the chance to be employed as a research assistant where I had first-hand understanding on how the research process works. The institution also continuously encouraged us to present our papers in conferences here and abroad. Aside from the very stimulating academic environment, UPPI fosters a very friendly atmosphere. The administrative staff were very supportive in providing the needs of the students. The librarians and computer laboratory personnel were very accommodating when we use their facilities. Although most classes I had at UPPI were small, I still met many other students, past and current, who were never selfish in sharing their resources, networks, advice, stories, and food. I am really thankful for being part of this great institute. *Ms. Rea Jean P. Tabaco (MPOPS, 2015) is a consultant at the Asian Development Bank.